Legal and judicial costume is defined as special occupational dress worn by judges and members of the legal community to mark their membership in this professional group. Legal and judicial dress has its origins in royal and ecclesiastical history. Prior to the early modern period, monks and other ecclesiasts were responsible for the administration of justice in the European territories. By the fifteenth and sixteenth centuries, this group was replaced by lesser nobility appointed by European sovereigns. As direct servants of the monarch, they were charged with the administration of sovereign law, and it was important for their clothing to reflect the legitimacy and authority of the sovereign's rule. Therefore, early judicial and legal dress borrowed heavily from the styles of the church's legal representatives, while reflecting the new era now defined by royal rule. During the fifteenth and sixteenth centuries, judicial dress varied considerably between nations due to the decentralization of ownership and rule in Europe. Ecclesiastical costume history, however, assured some general similarities in basic judicial and legal dress among European nations. Judges of the early modern period wore sleeved tunics, and over this, wide-sleeved pleated gowns or robes made from cloth, wool, or silk. This garment, previously worn by monks, was sometimes referred to as a supertunica. High judges might wear tabards (essentially, a sleeveless version of the supertunica) instead. Judges also wore closed mantles covering the shoulders to the middle-upper arm, and rolled hoods or casting hoods of the same fabric, lined with miniver. For ceremonial occasions, some judges wore a shorter cloak, called an armelausa (in France, called a manteau), made from the same fabric. Despite this basic attire, there was little consistency in color of judicial uniform. James Robinson Planché summarizes this point well in his Cyclopædia of Costume: "Information respecting the official costume of the Bench and the Bar is abundant; but, unfortunately, the descriptions are not so clear as they are copious" (Planché, p. 426). Royalty frequently dressed judges in ornate, regal costumes of scarlet and black, although vibrant hues of pink, violet, and royal blue were also common. Color reflected royal taste, but also judicial rank or position, and lower judicial officials wore different colors than presiding judges. Justices of the peace, appointed on a local basis to police the king's laws and manage local affairs, wore lay dress associated with their middle-class rank. Upon the head, members of the early modern judiciary typically wore a coif, a white circular lawn or silk cap, along with a black silk or velvet skullcap on top. Such head coverings bore resemblance to academic dress, which signified the possession of a doctorate degree. In fact, "The Order of the Coif" was a name given to a group of British sergeants-at-law, a special legal class who comprised the body from which high judicial offices was chosen. Judges often wore another hat on top of the coif and skullcap, particularly in France and Germany. Early costume for lawyers, also known as barristers, solicitors, advocates, or councillors, depending on the country, bore strong similarities to that of judges. During the Middle Ages, lawyers were considered to be apprentices to the judiciary, which explain the likeness in dress. Like their judicial counterparts, barristers in Britain also wore closed gowns made of cloth or silk. These garments, however, had raised, stuffed shoulders and elbow-length glove sleeves. Even before Queen Mary's death, these gowns were predominantly black, in accordance with the rules of the Inns of Court that organized barrister education and membership. Like judges, barristers also wore coifs and skullcaps, as well as white ruff-like bands around the neck. Solicitors, who unlike barristers, did not have the right to present in court, wore long, open black gowns with winged sleeves, although by the seventeenth century, they had lost their special dress and instead wore common business attire. French advocates wore wide, colored, bell-sleeved gowns, often in scarlet, with shoulder pieces and chaperons like their judicial counterparts. They also wore white bands and stiff black toques called bonnets carrés. Historically, monarchs set out complex dictates on judicial and legal dress, which reflected that individual sovereign's taste. By the seventeenth century, as countries continued to centralize and codify legal order, it became important to systemize the mélange of customs and traditions relating to legal and judicial dress. This did not, however, result in a simple, concise, framework for dress-in fact, the exact opposite! In 1602, France regulated, by royal mandate, the dress of its judges and lawyers of all ranks. Although scarlet still predominated, the monarchy dictated the specific robe fabrics, colors, and lengths for its judges, advocates, and clerks. It even made distinctions for colors by seasons and days of the week. Britain had similarly intricate legislation, which resulted in complicated and confusing dictates. According to the 1635 Decree by Westminster, the monarch became the exclusive administrator of judicial dress. From spring to mid-autumn, it was mandatory for judges to wear a taffeta-lined black or violet silk robe with deep cuffs lined in silk or fur, a matching hood, and a mantle. Judges were also required to wear coifs, caps, and a cornered cap on top. During the winter months, the taffeta lining was replaced with miniver to keep judges warm. Special scarlet dress replaced this standard costume on holy days or the visit of the Lord Mayor. There was no parallel code for barristers' dress at this time, and the Inns of Court governed bar costume. During the same time, Britain also regulated the judicial dress of the American colonies. Settlers followed codes and ceremonies of British law, and while little has been written on judicial and legal dress in the colonies, scarlet, which was the ceremonial and traditional color for British judges, was de rigueur for the colonial bench. American dress, however, did not mirror the same level of British complexity, given the puritan and austere circumstances and culture of the region. Even the dignified and traditional dress of the legal and judicial system has not been isolated from whims of popular fashion. The wigs worn by members of the British bench and bar are perfect examples of this idea. Fashion has always influenced its styles, from changes in sleeve to ruffs and sashes. Charles II imported the wig from France in 1660, and during the seventeenth century, they were a fashionable item for all gentlemen of wealthy and established social classes. Made from human or horsehair, they sat very high at the crown, and cascaded in curls over the shoulders. Judges and barristers took to wearing these fashionable full-bottomed wigs with their robes, no doubt under the recommendation of Charles II. By the middle of the eighteenth century, wigs fell out of favor with the general public, but legal professionals adopted the wig as a vital part of the legal and judicial uniform. In the early 2000s, high-court judges and the Queen's Counsel in Britain and the Commonwealth continue to wear full-bottomed wigs for ceremonial occasions, and shorter bench wigs are customary for daily courtroom proceedings. 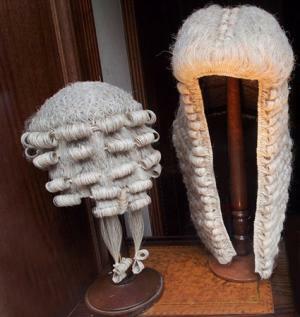 Barristers wear an even more abbreviated version of the seventeenth-century wig, known as a tie-wig, which sits back from the forehead to expose the hairline. The styles put into place in the seventeenth century for the legal and judicial community have persisted in their basic form, although styles for sleeves, collars, and accoutrements like wigs and bands have changed, according to lay fashion and monarchial taste. Central governments rather than monarchs regulate legal and judicial dress, and complex and confusing directives, in principle, continue to exist. In Britain, judges, barristers, and court clerks sitting in high courts are generally required to wear black silk or stuff gowns over suits, and a short bench or tie-wig and bands. Black robes for judges account for more of their dress than in previous times, and high court, district, and circuit courts prescribe their use all or much of the time. More frequently, colored mantles or sashes denote the type of case and court a judge presides over. Scarlet robes remain reserved for ceremonial occasions, as well as for some high-court criminal cases in winter. Violet is also used for certain cases according to season and court. Judges may be called to add or remove cuffs, scarves, mantles, and hoods of varying color and fabric at different times and seasons. These rules, however, are frequently amended and discarded in practice by judges in particular, who may dispense of their wigs or robes, either due to weather or due to special circumstances, such as cases involving children. 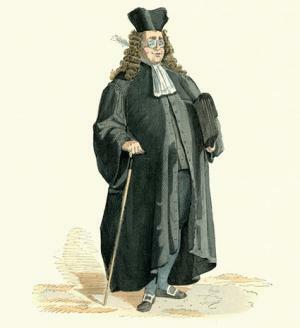 Barristers' dress remains more clear-cut, and in court they continue to wear black silk or cloth gowns, tie-wigs, and bands, depending on the seniority of their position. Solicitors and lower court officials do not wear wigs. Justices of the Peace, now predominantly confined to name only, do not wear any special dress. Free use of color in judicial dress lasted in European countries until the late seventeenth century, when the black robe, which many consider to be the traditional judicial color, became the preferred color for daily judicial dress. France adopted black as the color of dress for its judges, and historians believe that the British tradition of black robes began when barristers and judges adopted mourning dress for Queen Mary II in 1694. Although high court judges eventually reverted back to colors of scarlet and violet, it remained for barristers, lower-court judges, and court clerks in Britain. By the eighteenth century, American judges had followed suit, though as a symbol of liberty from British control over the American colonies. Like Britain, France has also retained its complex guidelines for members of the legal profession. French high court judges traditionally wear bell-sleeve cloth or silk black gowns and heavy draped manteaus lined with rabbit fur. Over the coat, they also wear fur shoulder pieces upon which they hang national medals. Like Britain, this full dress is not always abided by in daily practice. For ceremonial occasions, high-court judges may wear scarlet robes. Lower-court judges wear similar robes in black or scarlet with black satin cuffs. Unlike their British or American peers, these robes button down the front, and have trains that can be tucked up inside the robe. Additionally, they wear black moiré belts and epitoges, or shawls tipped in ermine or rabbit, along white cloth fichus. They also continue to wear black toques. Although French advocates wear business attire outside of the courtroom, they still wear black robes like their lower court judicial counterparts in court trials. They can, but rarely do, wear toques as well. French court clerks wear dress similar to advocates, but this depends on the formality and level of the court. Other European countries follow similar national judicial-costume history, and even the European Community's high judges wear distinctive scarlet or royal blue judicial robes, although this is governed by tradition rather than written statute. Lawyers and advocates presenting at the European Courts of Justice wear their national legal costume, whether it be plain dress or robe. Unlike in Europe, both national and local governments regulate judicial and legal dress in the United States, and American legal costume is confined only to judges. All levels of the judiciary wear long, black, cloth or silk gowns with bell-sleeves and yoked necklines. They wear no wig, special headdress or collar, although male judges are expected to wear a shirt and tie underneath their robes. There is no specific dress code for court clerks appearing in courts, although professional dress is assumed or required. Justices of the Peace, now largely succeeded in authority by organized lower-level courts, wear lay dress as well. Legal and judicial dress is produced by specialized manufacturers and sold through specialty legal retailers or by companies that also cater to academic and religious vestments. 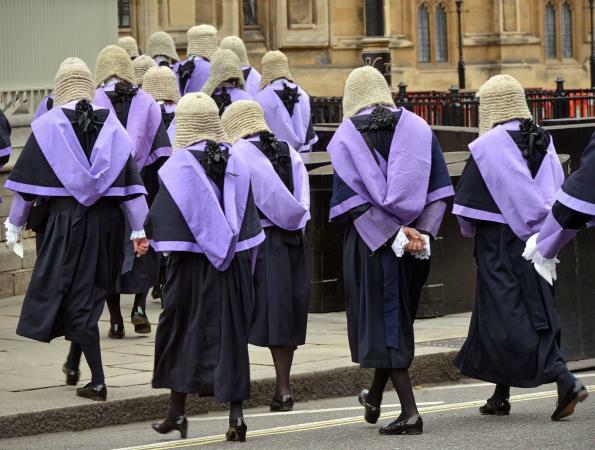 Legal dress can be quite expensive, and in Britain, a black judicial gown may cost between £600 ($960) and £850 ($1,360), and a full-bottomed judicial wig, £1,600 ($2,560). Such expenses have actually resulted in a thriving market for used wigs in Britain. Some high-court judges in Britain and other European countries are given a stipend for their judicial attire, but lower-court judges, barristers, and advocates, must provide for their own. In America, judges are expected to pay for their judicial dress, but pricing is far more moderate. There has been considerable debate since the mid-1980s about the relevance of traditional legal and judicial dress in modern society. The United States and many European countries have relaxed regulations regarding such attire, particularly for judges, and judges have had the ability to exercise their individual judgment in such matters. Judges in Britain have chosen to dispense with wigs and robes upon certain situations when they want to convey a feeling of equality to laypersons, and Muslim and Sikh judges wear their turbans instead of wigs. Modernization has also included the exercise of individual judicial tastes as well. In 1999 American Supreme Court Justice William Rehnquist chose to wear a robe decorated with gold stripes on each sleeve at the Impeachment Trial of President William Jefferson Clinton. Justice Byron Johnson of the Idaho Supreme Court in the United States chose to wear a blue robe, rather than a black one when he sat on the bench. Although both examples are American, they reflect the questioning of relevance of judicial and legal dress in the early twenty-first century, and how it relates to the role of judges and lawyers in community organizations. Another example of modernization is the ongoing debate regarding the relaxation of legal and judicial garb in the United Kingdom, and specifically the abolishment of wigs. In 1992, and again in 2003, the judicial system in Britain debated the redesign of judicial and legal dress in order to be more relevant to society. With this has come the question of whether to retain the wig. In addition to being a visual guide for members of the legal profession to that of their peers, the image of judges and barristers in their traditional occupational dress for society reminds the public of the dignity and gravity of the law, and the impartiality of the judicial system. It also acts as a disguise to protect judges and barristers outside of the courtroom, as well as a tool for downplaying differences in age and gender. Hence, the decision to retain, relax, or disband with legal and judicial dress, extends beyond a discussion of the physical garments. Current debates about judicial dress are also deliberations over the function of governments and tradition in the structure of civil life, and the role of a judicial representative in the modern execution of justice. See also Royal and Aristocratic Dress. It should be noted that there are very few books devoted to legal and judicial dress, and even fewer incorporating issues of modernization. Information can often be found in the occupational dress section in general costume histories, but books specifically dedicated to the history of judicial and legal practice too often omit dress from discussions. History journals and legal journals have been the most helpful sources, and information covering Britain and America are most predominant. Journals documenting parliamentary discussions and debates are also useful as primary source material. Hargreaves-Mawdsley, W. N. A History of Legal Dress in Europe until the End of the Eighteenth Century. Oxford: Clarendon Press, 1963. An indispensable authoritative book of European legal dress before the eighteenth century. MacClellan, Elisabeth. Historic Dress in America, 1607-1870. Philadelphia, Pa.: George W. Jacobs and Co., 1904. Good for judicial dress and history in the American colonies. O'Neill, Stephen. "Why Are Judges' Robes Black?" Massachusetts Legal History: A Journal of the Supreme Judicial Court Historical Society 7 (2001): 119-123. Very useful for American dress. Planché, James Robinson. Cyclopædia of Costume or Dictionary of Dress. Volume 8: The Dictionary. London: Chatto and Windus, Piccadilly, 1876. Very helpful as a detailed source of early legal garments, given the confusing nature of the dress. Extensive reference to primary sources. Webb, Wilfred M. The Heritage of Dress. London: E. Grant Richards, 1907. Good discussion about the history and vestiges of early legal dress. Yablon, Charles M. "Judicial Drag: An Essay on Wigs, Robes and Legal Change." Wisconsin Law Review. 5 (1995): 1129-1153. Lively, entertaining article encompassing the history, political and sociology behind judicial dress. Worth tracking down.